Photo: Kelvin Bulluck, 2018. Click to download hi-res. 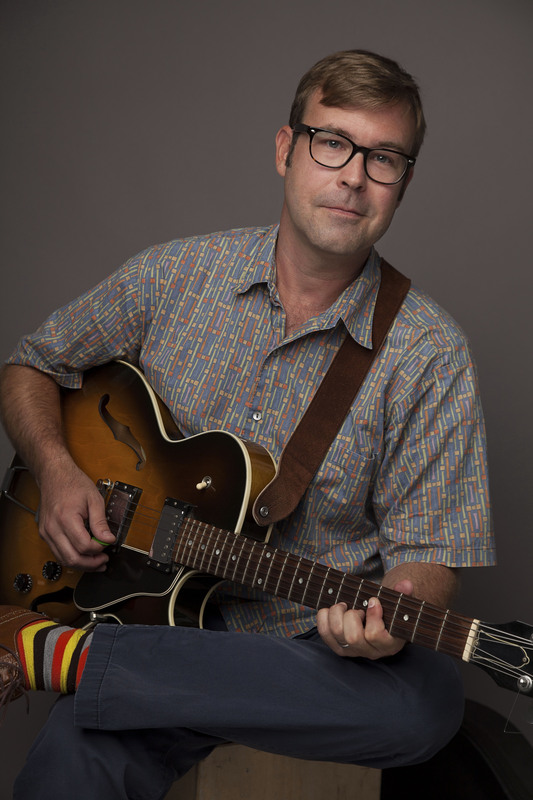 Lawrence Lanahan has performed his songs in the Baltimore area for over 15 years, both by himself and with the bands Oella and Disappearing Ink. He has also studied jazz with Carl Filipiak and composition with Judah Adashi. Lanahan has released two albums: a self-titled EP in 2004, and a full-length as Disappearing Ink in 2014. In 2019, Disappearing Ink will release another record. You can preview that album in this video. Lanahan has performed at Artscape, Shakemore, 8×10, and Ottobar in Baltimore; Galaxy Hut and Iota Club and Cafe around Washington, D.C.; and Sidewalk Café and Pete’s Candy Store in New York City. He has shared bills with Harry Shearer, Mic Harrison (Superdrag/V-Roys), Tarbox Ramblers, and The Yayhoos. Lanahan’s song “The Big Move” was a finalist in the 20th Annual Mid-Atlantic Song Contest. Leo Kottke meets Ummagumma-era David Gilmour meets Radiohead…Finally, a singer-songwriter with the guts to breathe some life into an otherwise stagnant genre. Chilling chord progressions merge with haunting Buckley-esque vocals to create a new sound that’s deeply rooted in the finer moments of 70’s acoustica. This disk will absolutely stay in the CD changer… While Lanahan’s peers are sifting through David Gray’s coffee grinds looking for the essence of his brilliance, Lanahan is content to distill his own home brew. In the process, he’s creating his own genre, but will anyone else have the guts to join him? Lanahan leans toward intricately finger-picked melodies of a country-blues flavor, and it lends his self-titled debut CD EP a backwoods expanse. “6 out of 10” — If it’s comparisons you’re after then vocally (particularly “Great Hall” and the wonderful “Weddings and Engagements”) – Mason Jennings is as close as anything and how can that ever be a bad thing? In just over 25 minutes Lawrence Lanahan delivers enough melodic and lyrical invention to suggest that a full-length album will be well worthy of investigation. A DIY release of pleasant indie pop from Baltimore…folky finger pickin’ and country twang in the guitars & some clever lyrics. A fine release that deserves some airplay. Much like the eccentric “rurality” of Iron and Wine or Crooked Fingers, Lawrence Lanahan crafts a sound unmistakably American, steeping in tradition while yearning to arrive somewhere outside the canon of folk aesthetic. Whether employing wit, emotion, or bizarre narration, he commands his music with rare honesty and power. Lanahan proves his mettle as a storyteller here…he has a tale to tell and he tells it well. An acoustic performer of intricately picked guitar work and melodious, thoughtful songs. Perhaps the final track “Boards” is an omen of good things to come in the future. It’s my favorite here… there are some interesting lines about Baltimore and some images that offer a bit of insight into Lanahan’s mind.